Happiness to me means to have a good job – have a good relationship and have a good home! Young people are suffering the “worst economic prospects for several generations”, according to a major state-of –the-nation report. This does not come as a surprise, it is one of the many disheartening claims that has circulated recently in the media in relation to the future prospects of young people. Newspapers often paint a scary reality that foresees poor job and housing opportunities, and portrays young people as one of the most anxious and resentful generations yet. 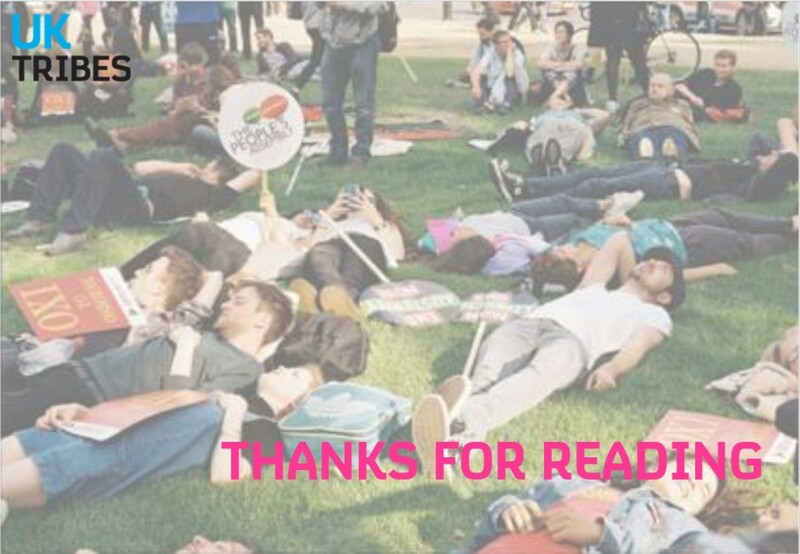 With so much attention on this topic it’s no wonder young people may be feeling demoralised, but is the media’s reality one young people are fully prepared to accept? 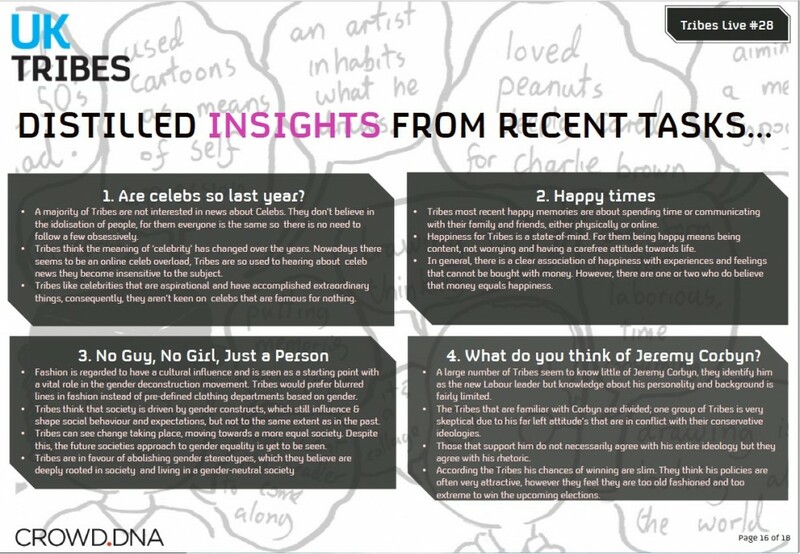 This month we are uncovering just how Tribes are feeling when it comes to their future. STAT: Unemployment rate for young people is 14.4% while the overall unemployment rate now stands at 5.7%. various societal, political and economic changes that structurally prohibit many of them from achieving the lifestyle and material security that their parents had at their age. This is the first generation who are growing up to believe that they’ll be less well-off than their parents. Housing opportunities have become something to worry about on a daily basis due to welfare cuts and ever-rising rents, especially for our urban dwelling Tribes. Furthermore the financial crisis and its aftermath are still having an on-going impact on their job security. Although general unemployment figures have dropped in the past few years, youth unemployment has continued to rise and they have been hit by the greatest relative drop in income in recent years. Under-25s are now almost three times more likely to be jobless than their elders according to the Office of National Statistics (ONS). Consequently, recent reports by YouthNet, a UK youth charity dedicated to providing frank and unbiased information about the life of young people, suggests that a third of young women and one out of ten young men suffer from episodes of anxiety. While housing is a major concern for many Tribes, there is a clear age divide when thinking about the topic. 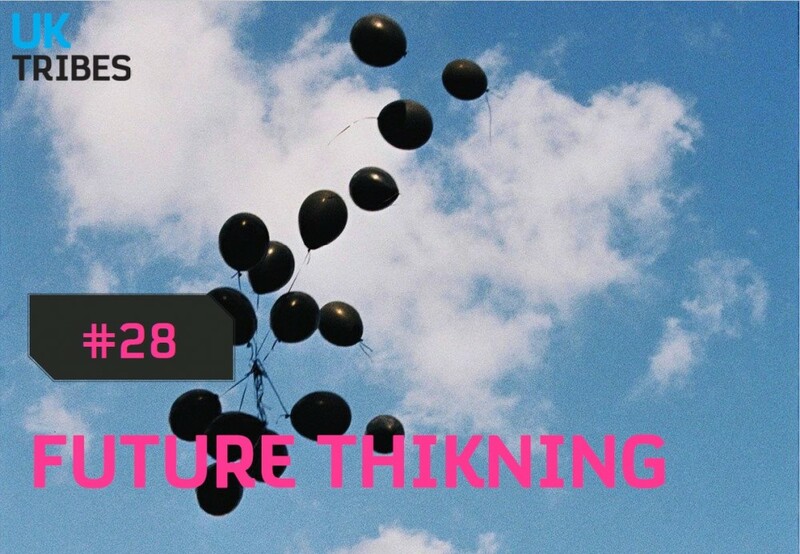 Younger Tribes, ranging from 16-18, are far-removed from the housing crisis, are generally protected by the parental bubble and are therefore more optimistic about the future. 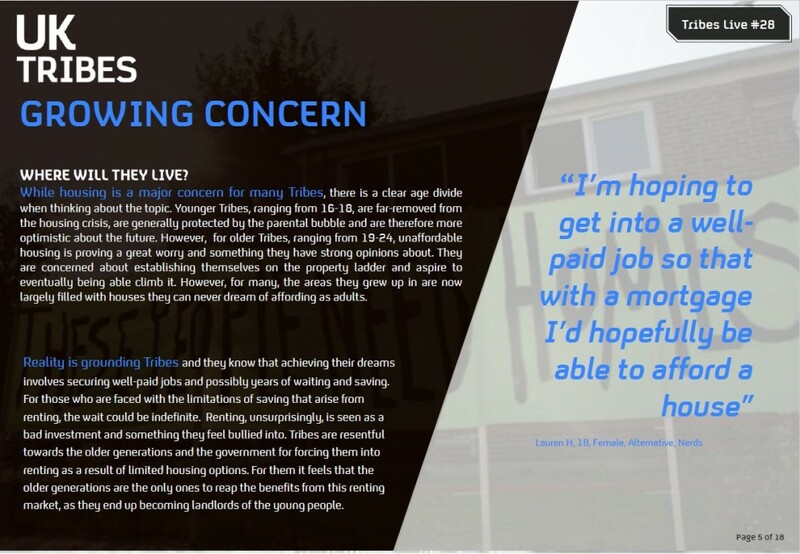 However, for older Tribes, ranging from 19-24, unaffordable housing is proving a great worry and something they have strong opinions about. They are concerned about establishing themselves on the property ladder and aspire to eventually being able climb it. However, for many, the areas they grew up in are now largely filled with houses they can never dream of affording as adults. 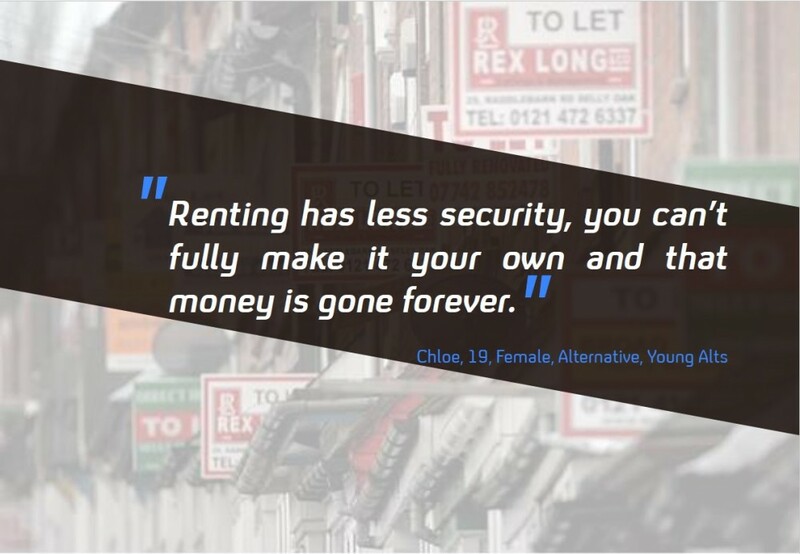 Renting has less security, you can’t fully make it your own and that money is gone forever. 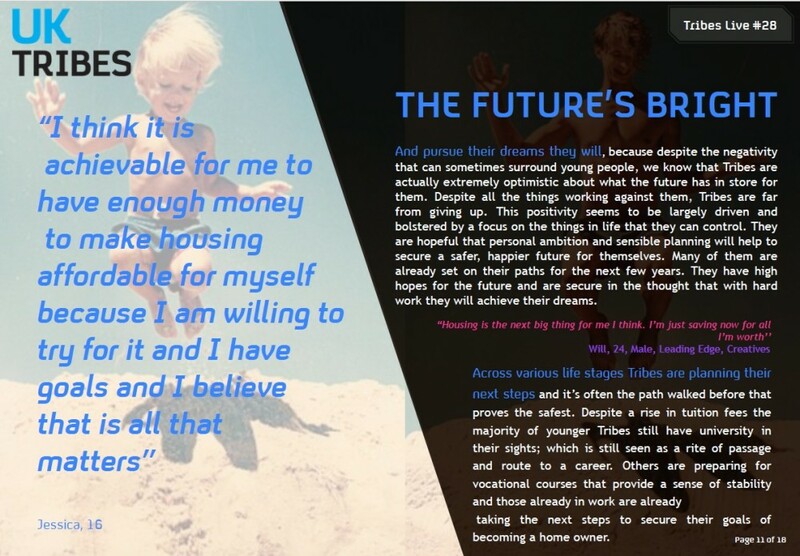 Reality is grounding Tribes and they know that achieving their dreams involves securing well-paid jobs and possibly years of waiting and saving. For those who are faced with the limitations of saving that arise from renting, the wait could be indefinite. Renting, unsurprisingly, is seen as a bad investment and something they feel bullied into. Tribes are resentful towards the older generations and the government for forcing them into renting as a result of limited housing options. For them it feels that the older generations are the only ones to reap the benefits from this renting market, as they end up becoming landlords of the young people. Similar to the anxiety that accompanies housing, Tribes have concerns around the problems they may encounter when entering the job market. While qualifications are luckily not an issue for most Tribes, who feel they are well educated, finding a job and having financial security is a barrier they fear they will face. Tribes fear the gap between university and the workplace, where they are either unsure of what steps to take or starkly aware that competition in their chosen industry is on the increase. Tribes have always had a clear path to follow from school to Uni to first job, and this gap represents a period of ‘the unknown’. The first time where they feel truly out of their depth and inexperienced. Furthermore, the job market is hardly painted as thriving so it’s no wonder that Tribes are concerned that qualifications and hard work will not necessarily equal career success. I’m a little scared about what the future NHS will look like. 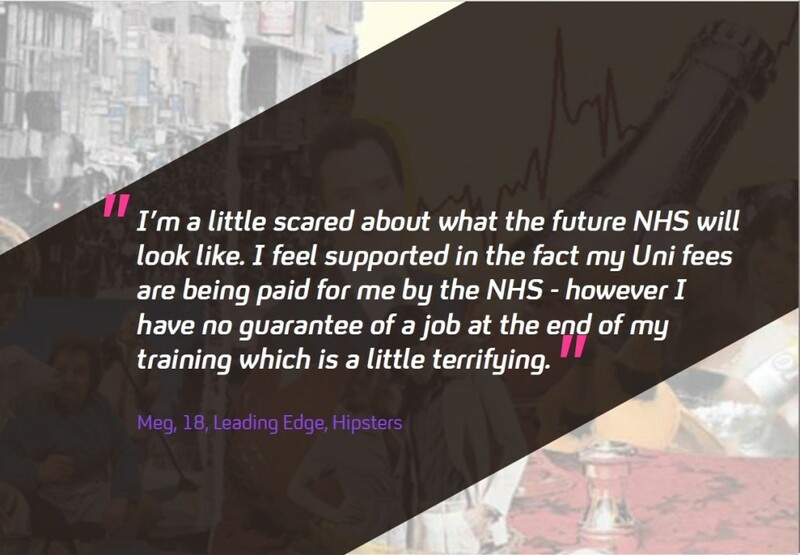 I feel supported in the fact my Uni fees are being paid for me by the NHS – however I have no guarantee of a job at the end of my training which is a little terrifying. With all these concerns bubbling under the surface, what Tribes really need is some clarity around what’s in store for them. While their schools and families offer support, Tribes still feel that to some extent they are being left out in the cold. Being brought up by Baby boomers and Gen Xs during the economic recession means Tribes are constantly trying to live up to the expectations set by their parents who have maybe forgotten how scary it can be starting out in the world. 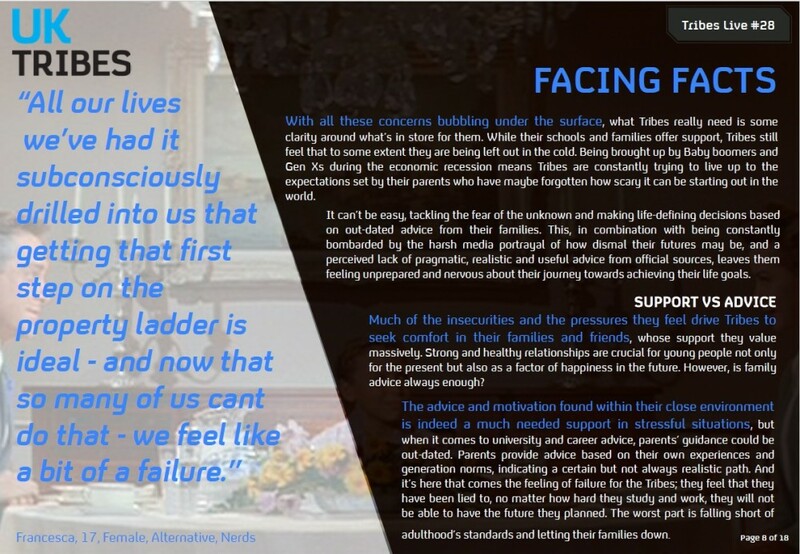 It can’t be easy, tackling the fear of the unknown and making life-defining decisions based on out-dated advice from their families. This, in combination with being constantly bombarded by the harsh media portrayal of how dismal their futures may be, and a perceived lack of pragmatic, realistic and useful advice from official sources, leaves them feeling unprepared and nervous about their journey towards achieving their life goals. All our lives we’ve had it subconsciously drilled into us that getting that first step on the property ladder is ideal – and now that so many of us cant do that – we feel like a bit of a failure. Much of the insecurities and the pressures they feel drive Tribes to seek comfort in their families and friends, whose support they value massively. Strong and healthy relationships are crucial for young people not only for the present but also as a factor of happiness in the future. However, is family advice always enough? The advice and motivation found within their close environment is indeed a much needed support in stressful situations, but when it comes to university and career advice, parents’ guidance could be out-dated. 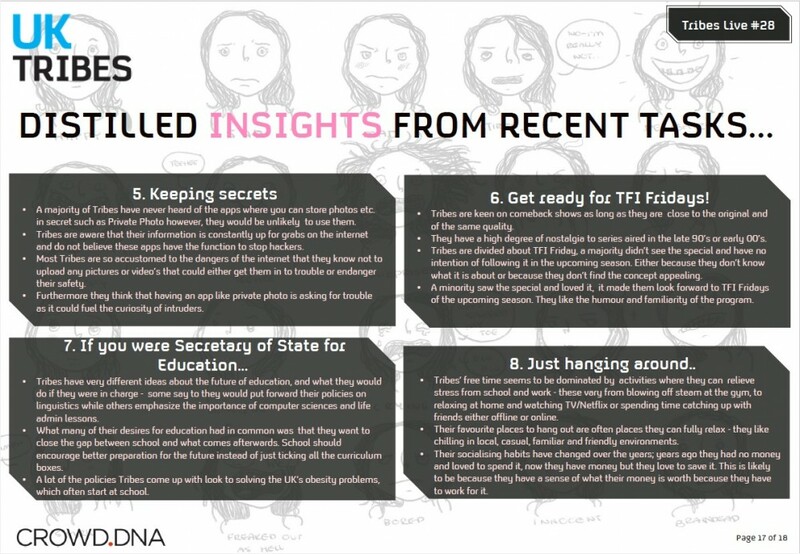 Parents provide advice based on their own experiences and generation norms, indicating a certain but not always realistic path. And it’s here that comes the feeling of failure for the Tribes; they feel that they have been lied to, no matter how hard they study and work, they will not be able to have the future they planned. The worst part is falling short of adulthood’s standards and letting their families down. What is really missing is expert help tailored to their needs. 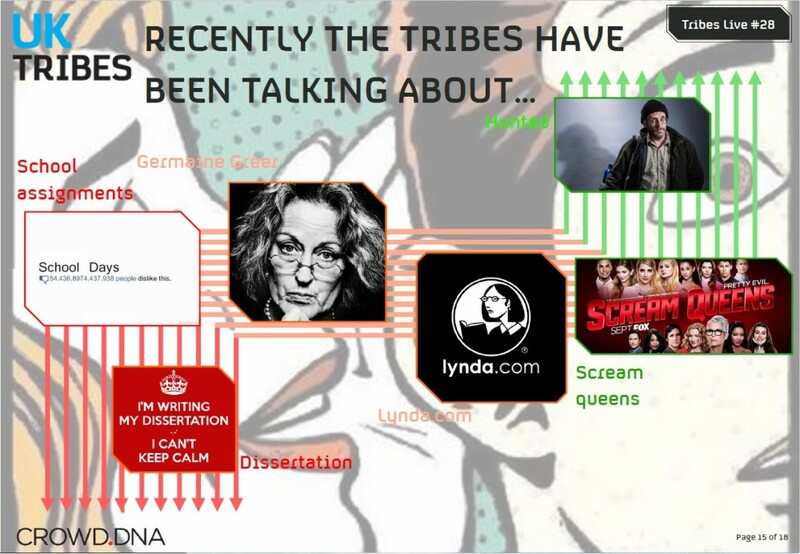 Tribes are looking for specialist knowledge that fully prepares them for the decisions they will have to make. While government initiatives and university and career fairs offer an overview of available choices, young people require a more proactive approach to careers education, designed to prepare them for the workplace in this competitive market and help them make informed decisions about their future. Many Tribes are being driven to university, accepting the high fees and future debt yet feeling that they’re still not receiving the information and skills they need to enter the workplace with confidence once they’ve finished. 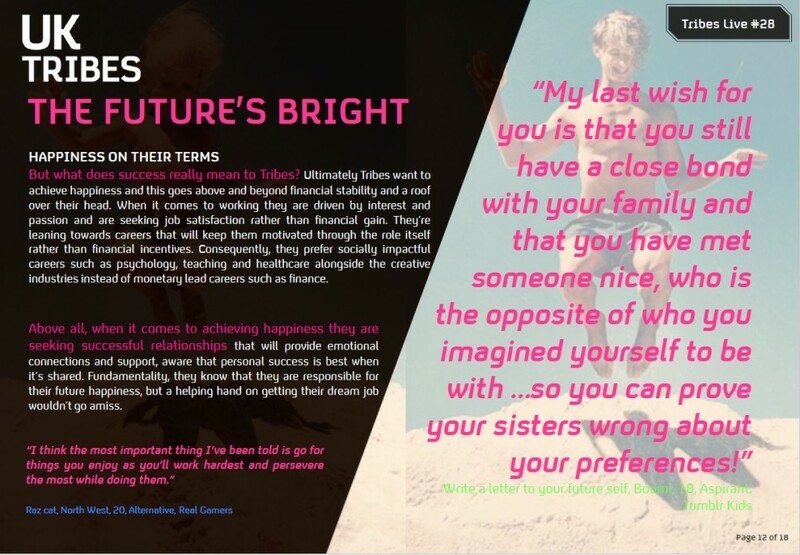 There is a need for spot-on input from business experts and age-specific, tailored advice to help young people make informed decisions and build the confidence they need to achieve. Tribes want a snapshot of their future, a first-hand experience to see if it’s right for them before they decide to pursue it. My Sixth Form are very supportive, but that’s more about getting into university and not careers. I think support should be offered from about Year 10 onwards, as people who are just starting their GCSEs will need to make informed choices about what they’re doing. And pursue their dreams they will, because despite the negativity that can sometimes surround young people, we know that Tribes are actually extremely optimistic about what the future has in store for them. Despite all the things working against them, Tribes are far from giving up. This positivity seems to be largely driven and bolstered by a focus on the things in life that they can control. They are hopeful that personal ambition and sensible planning will help to secure a safer, happier future for themselves. Many of them are already set on their paths for the next few years. They have high hopes for the future and are secure in the thought that with hard work they will achieve their dreams. Positive mental attitude is a big thing for me – so I’m going to try and stay upbeat! Across various life stages Tribes are planning their next steps and it’s often the path walked before that proves the safest. Despite a rise in tuition fees the majority of younger Tribes still have university in their sights; which is still seen as a rite of passage and route to a career. Others are preparing for vocational courses that provide a sense of stability and those already in work are already taking the next steps to secure their goals of becoming a home owner. But what does success really mean to Tribes? Ultimately Tribes want to achieve happiness and this goes above and beyond financial stability and a roof over their head. When it comes to working they are driven by interest and passion and are seeking job satisfaction rather than financial gain. They’re leaning towards careers that will keep them motivated through the role itself rather than financial incentives. Consequently, they prefer socially impactful careers such as psychology, teaching and healthcare alongside the creative industries instead of monetary lead careers such as finance. Above all, when it comes to achieving happiness they are seeking successful relationships that will provide emotional connections and support, aware that personal success is best when it’s shared. Fundamentality, they know that they are responsible for their future happiness, but a helping hand on getting their dream job wouldn’t go amiss. For me, my future is mine and no-one will ever be able to tell me how to live it or what to do with it. Just know that whatever you decide for your own future, it is only yourself that is your own obstacle in life. 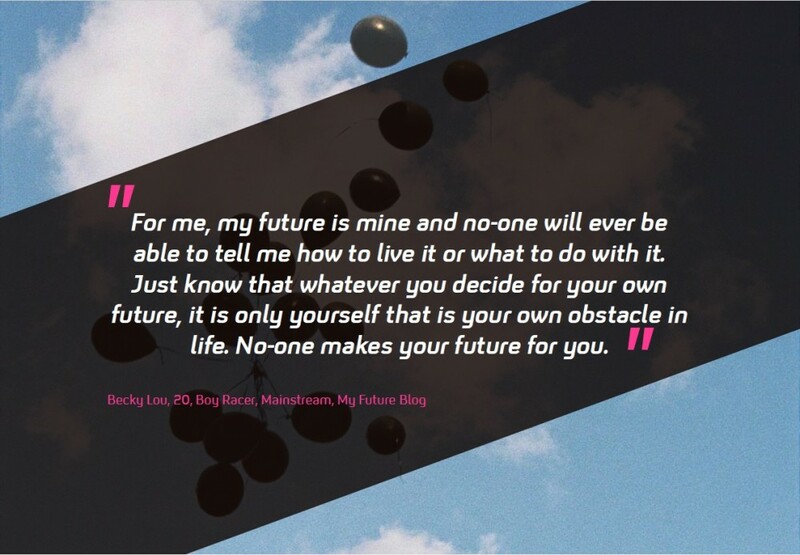 No-one makes your future for you. I hope you’ve found some motivation in your life – continued to follow your passions and have improved greatly health-wise. I hope you’ve finally managed to find somewhere affordable to live that’s not 100miles away from any family as seems to be the case now in 2015 – and have maybe even started (or thought about starting) a family of your own now you’ve got a home to yourself. I hope you’re happier and more focused – and I hope you’ve achieved all those little goals you set out – keep pushing forward it’ll all be worth it. I hope you’ve finally figured out a good way to help others struggling the same way you have. Above all – I hope you’re feeling better.